Historic Smithfield Plantation is located in Blacksburg, VA on the campus of Virginia Tech more than four hours from Annandale. This is not a tour suggested for your average Sunday afternoon, however, with so many Virginia Tech students, parents, & alumni in Annandale, you may find your self in Blacksburg with a spare couple of hours...if only you knew about this charming property. I actually have eleven VT alumni in my immediate family and none have ever toured Smithfield. Sometimes the best gems are hidden in plain sight. 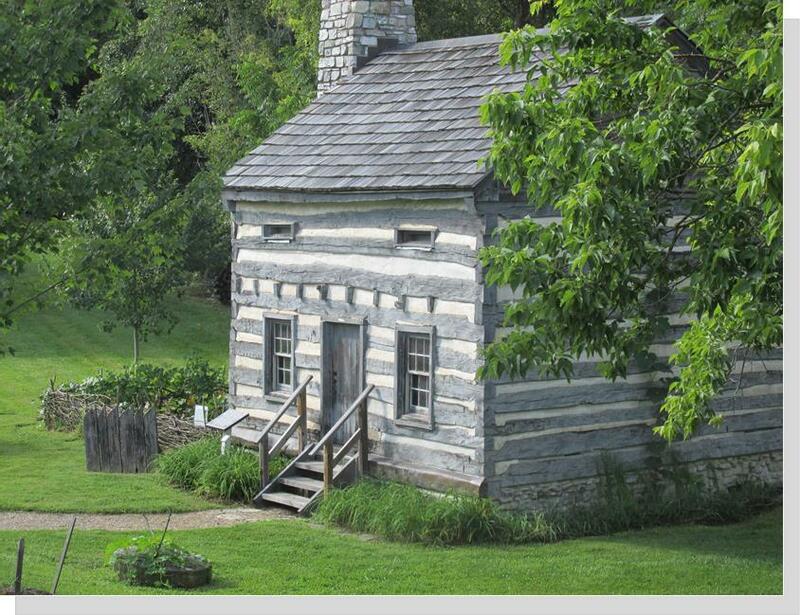 "Colonel Preston began at once to make Smithfield a productive and profitable plantation. He served as a member of the House of Burgesses and held the offices of County Lieutenant, Sheriff, and County Surveyor for Fincastle County, VA. One of his greatest contributions was opening up the Kentucky lands for settlement by the colonists who were pushing westward." Today, most acknowledge with horror the plundering of Native American lands, let alone with fierce and brutal force. 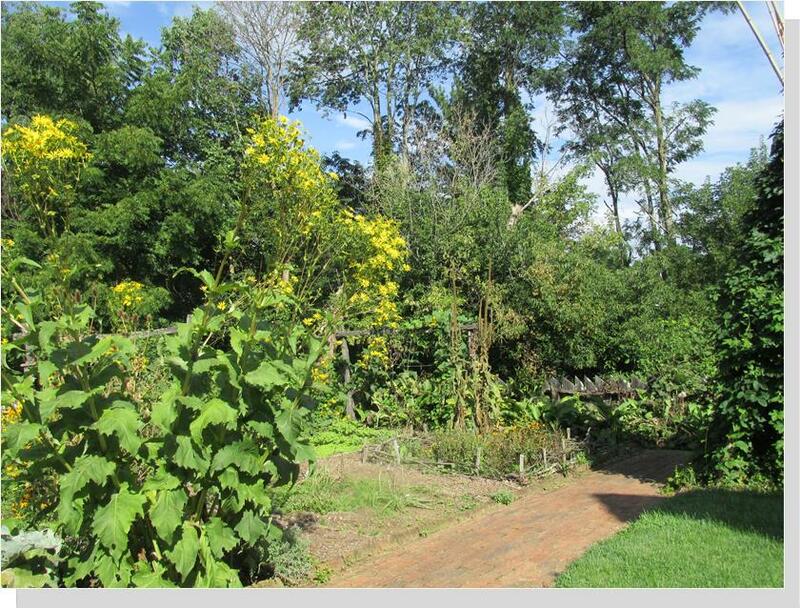 But, in the days of colony building, European settlers believed that to hold the land, they must clear, plant, seed and settle. They also conveniently believed in the divine right of Kings. Since settling America was the desire of their King, they saw the effort as a mandate from God. Colonization in the name of the King was a political and religious doctrine with royal and political legitimacy. Amazing how invoking the name of the Almighty permitted explorers then and civilizations even now to commit crimes of despicable horror without a trace of shame. Smithfield House is unusually spacious with high ceilings flooded with natural light and stunning vistas from every window. 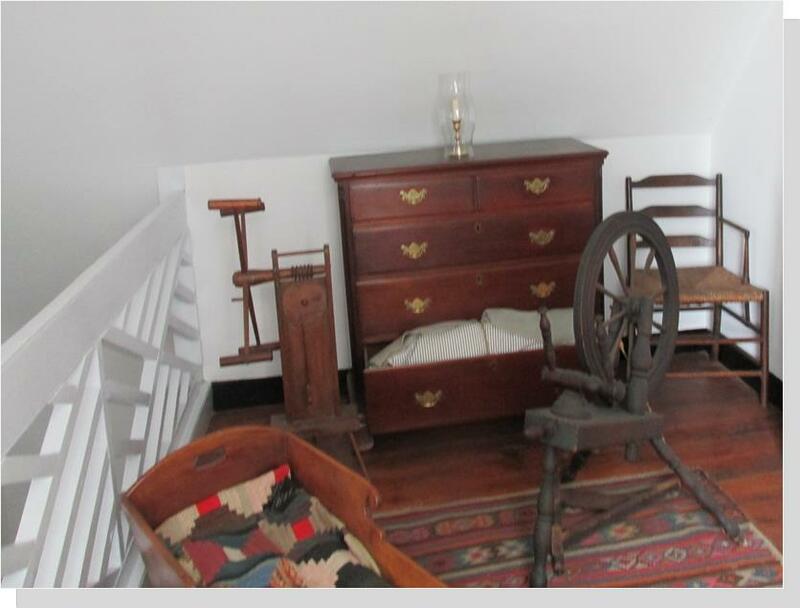 It would have been considered elegant for a frontier home which were more often constructed in the fashion of log cabins (see p. 19) than colonial quarters filled with Georgian decorative treasures. Smithfield House is a story and a half in height constructed of a white timber frame in a L-shape manner. Throughout are the most beautiful wide plank wood floors hewn on the estate from native trees. You enter the home through a commodious front hall accented with Chippendale railings along the staircase to the upper landing. 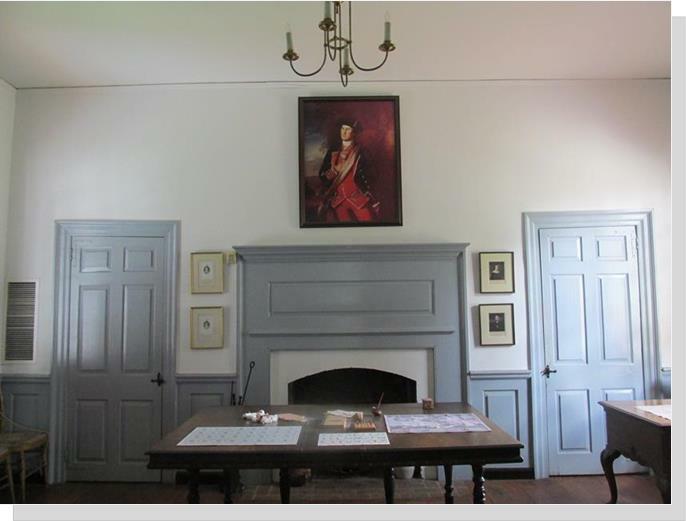 Off the hall is an expansive drawing room with raised panel wainscoting and a carved panel fireplace surround modeled after the one at the Raleigh Tavern in Williamsburg. 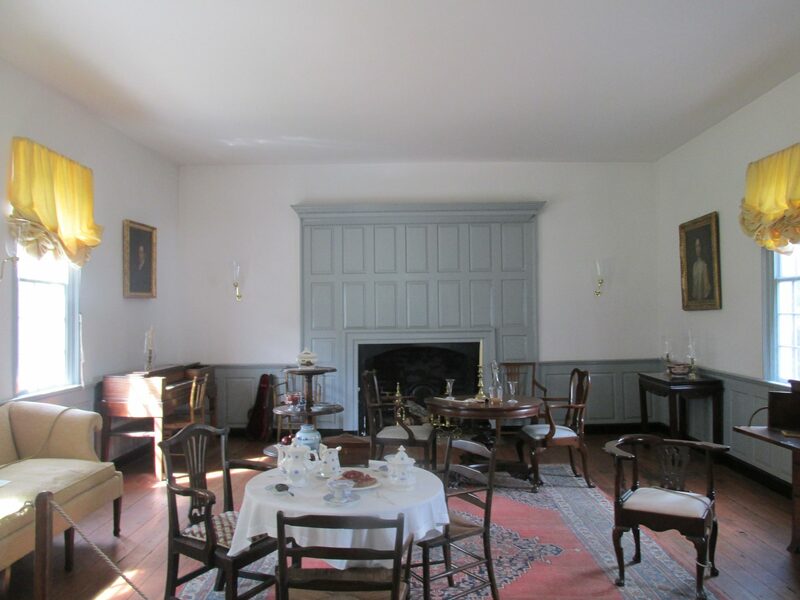 The wealthy planter culture of the Tidewater region is clearly evident in these public rooms. 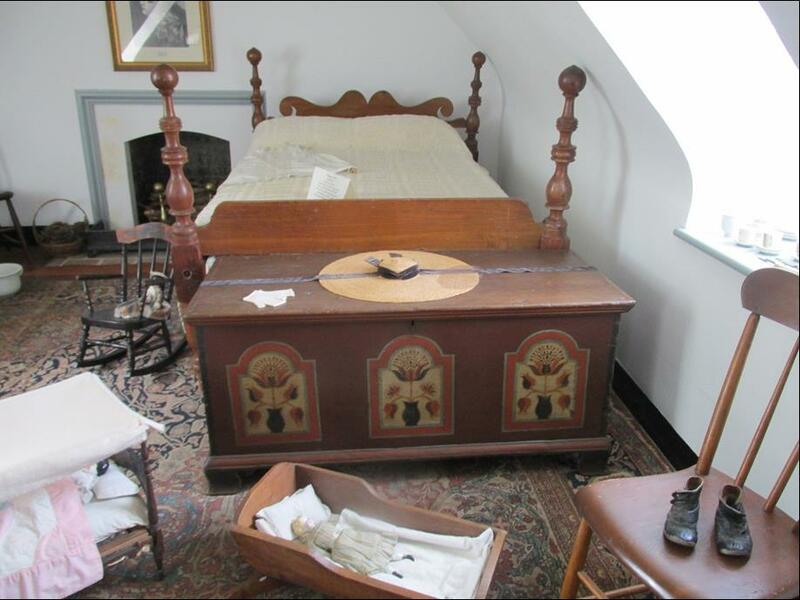 Downstairs is also the master bed chamber utilized by Col. and Mrs. Preston along with a young child tucked-up in a walnut cradle. Present in the master bed chamber is another large bed reserved for visitors. Bed curtains would be drawn on each of the four-poster beds for both privacy and warmth. The room is graced by a carved corner fireplace surround painted with a deep teal blue pigment known as Prussian Blue. This was the very first synthetic pigment invented around 1710 and declares the ostentatious wealth of the family. It also indicated that this room was to be shown off as a public room. 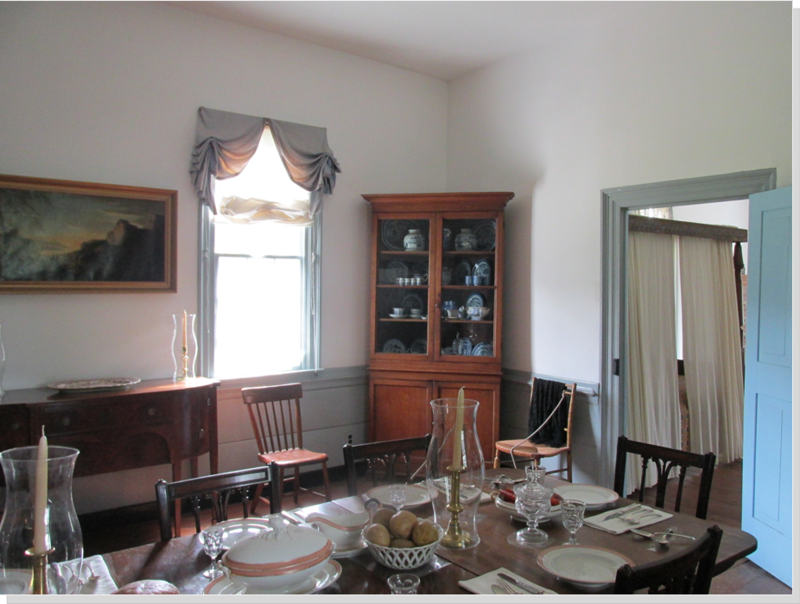 The dining room would have been the site of the main daily meal and entertaining. Children under the age of 12 were not allowed at the table eating instead in the school room/office just beyond. Family portraits convey the story of an educated, successful and patriotic family. Beautifully crafted cabinets are filled with precious china. Sideboards are laden with a large punch bowl and other signs of gracious dining all adding to the elegance of the room. 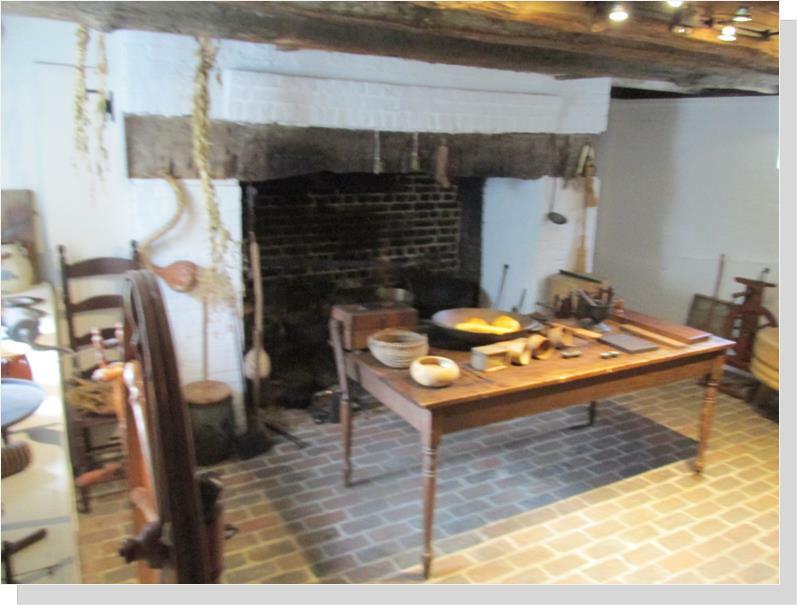 Below stairs includes a sizeable winter kitchen where staff (slaves in the early days) stood on dirt floors in front of a sizeable open cooking hearth featuring a massive chestnut mantle. In fine weather, most cooking would be done outside in order to keep the heat out of the house. Nextdoor to the kitchen is a small museum with a number of interesting displays including Indian artifacts, a Kentucky rifle, and period woodworking and surveying tools. During the Revolutionary War, patriot soldiers sent to the frontier by Gov. 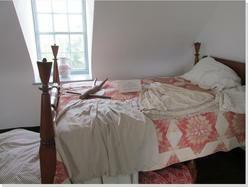 Patrick Henry were housed here. Eventually the house was donated to Virginia Tech, then known as Virginia Polytechnic Institute and State University...most particularly to their School of Agriculture and Animal Husbandry. 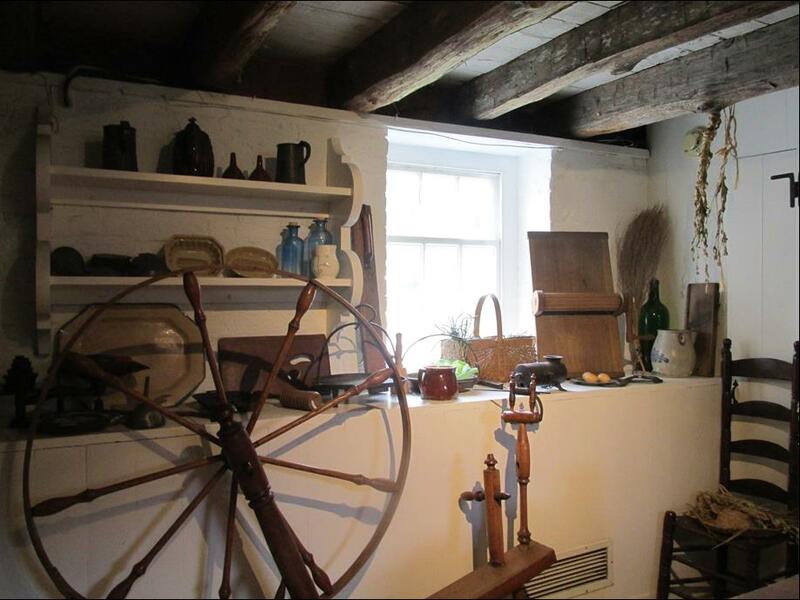 Unfortunately, the house was used to house hay while hogs were kept in the entrance hall. Not surprisingly those floors were largely destroyed. 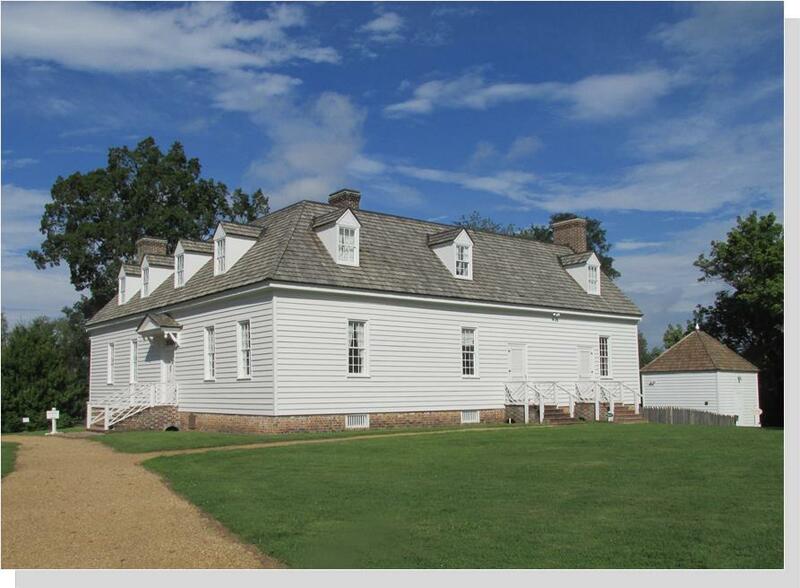 By 1959 the former owner Janie Preston Boulware Lamb, great-great granddaughter of Colonel William Preston, rescinded the arrangement and presented the house and 12 acres to the Association for the Preservation of Virginia Antiquities who were charged with restoration and repairs. A volunteer guild has been organized to present Smithfield activities to the community and act as interpreters/tour guides. They are most welcoming & gracious guides. Make a point of visiting Smithfield whenever near Blacksburg. 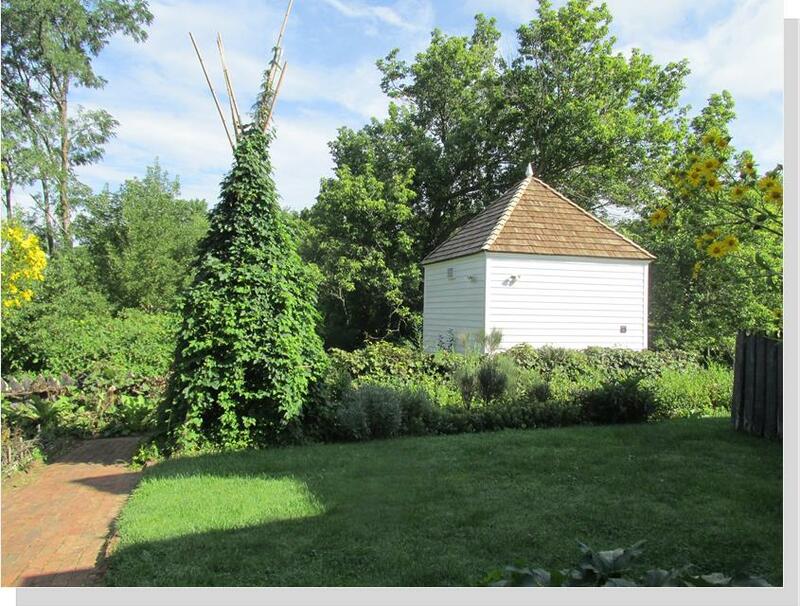 This slice of Virginia frontier history is rarely seen. Tough, patriotic, determined characters inhabited these dangerous lands that sat on the frontier of America and would become the launching point for further exploration upon the purchase of the Louisiana Territory. During the tour no mention was made of the parallel inhabitants of this plantation, that of the enslaved population although a page of comment can be found on their official website at www.historicsmithfield.org. According to a descendant of the one known enslaved family, the Fractions, Smithfield had between 45-100 enslaved persons providing both general and specialized forced labor…anything from carpenters and furniture makers to highly skilled cooks capable of mastering the complicated timing of an 18th century kitchen. 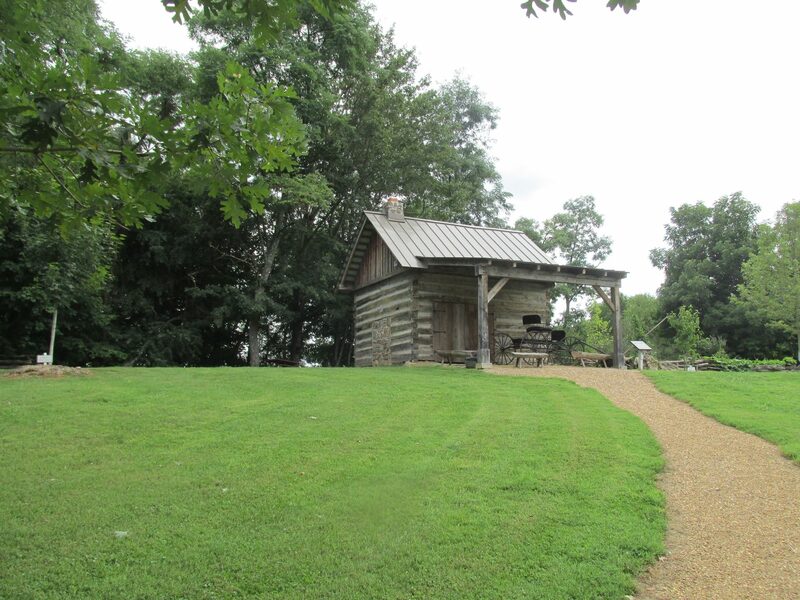 (1)Historic Smithfield Plantation, Smithfield Preston Foundation, Old Town Printing, Christiansburg, VA, 2013. p 15. (2) p. 4. (3) p.17. (4) Smithfield slave descendant to share her heritage" by Su Clauson-Wicker. Roanoke Times. April 11, 2019.